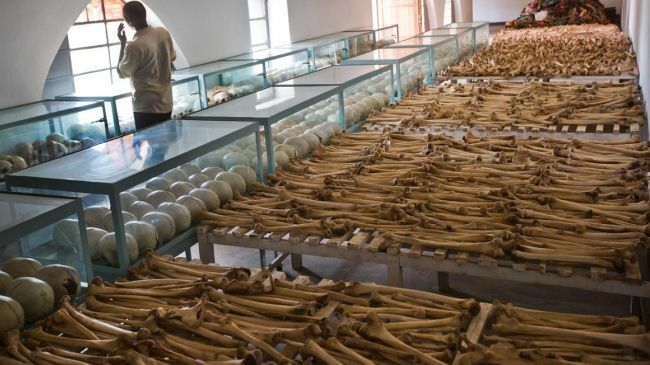 Late in 2016, the Rwandan government indicted several senior French Army generals for crimes against humanity, including genocide for their role in the 1994 Rwandan holocaust. The Rwandan case against the French generals is based on the French having instigated and trained the Interhamwe paramilitary Hutu militia that was responsible for most of the killings of the minority Tutsi tribe and its supporters. This most inconvenient of facts is admitted to by the French media that are still trying to shrug off blame for the French crimes in Rwanda and deny any “smoking gun” exists. This latest in a long series of Rwandan government exposés of the French military and Foreign Ministry’s role in the 1994 mass murder (some 800,000 by most accounts) provides that very “smoking gun,” for the well documented French military role in the very existence of the Interhamwe death squads in undeniable. Who is going to believe that after creating, training and paying the salaries of the leadership, the French had no idea the Interhamwe ethnic death squads were going to carry out what they were broadcasting so rabidly? It goes further, for the evidence shows the French were actually behind the mass murder in just another storm of massacre and mayhem that typifies neocolonial French Africa. All one has to do is view the excellent three-part series on Al Jazeera, “The French African Connection,” to hear first-hand senior French Intelligence agents matter of factly describe coup d’états and mass murder they directed in the years before the Rwandan genocide throughout neocolonial French Africa. After watching the series, tell me you still don’t believe the French were capable of the crimes committed in Rwanda in 1994? Earlier in 2016, news broke about the French role in suppressing the anti-neocolonial rebellion that broke out in Cameroon in the 1970s, where over 10,000 Cameroonian’s were murdered by the Cameroon Army directed by French officers. All to maintain French control of their former “colonies” and continue the super exploitation of African resources that is critical to maintaining the high standards of living the French people have come to expect. The French military is still very active in enforcing neocolonialism in French Africa, with contingents and or training operations in Mali, Central African Republic, Congo, Djibouti and Cote d’Ivoire. France has been at the forefront in demanding military intervention in Burundi by the UN, offering military forces for a potential occupation. French neocolonialism remains a potent force of reaction in Africa today and recognizing the French role in the Rwandan genocide in 1994 can play a vital role in helping the world understand this thorn in the side of the African peoples fight for independence, social equality and justice. Rwanda indicting French generals for genocide is a good start.